Now you can check and compare the popularity of any keyword with Google-fight .The service lets you know how much a site or keyword is popular on google.com. It is a really good tool to know how famous your site, product or any particular keyword is and compare that with your competitor. 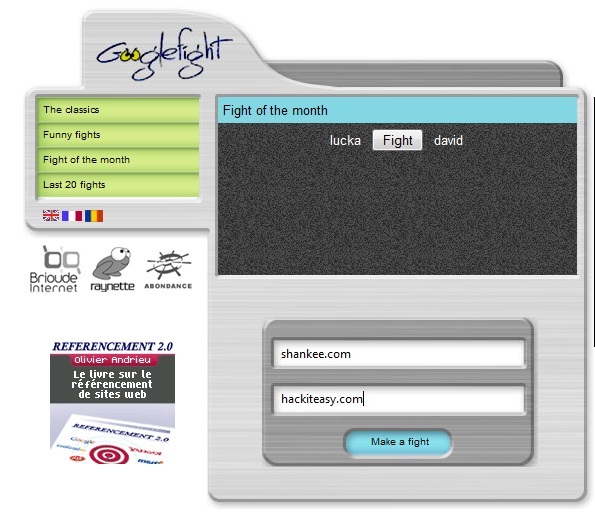 Googlefight just compares the number of results that would be shown on google when you type and word in the search box. And lets you compare the result with any other keyword of your choice. a fight between shankee.com and hackiteasy.com two of my blogs. I also came to know that my name Shashank Agarwal is quite famous and turned out to give over 23,000 results. The site has a good layout and i love the small flash that plays before the results are displayed before results. So just have a look and fight with google. Iphone 3G S is it really that good, covering the good and the bad about it . Sweet! this should give up some good info! An alternative to googlefight is zurdler Its like googlefight but without the fighting.